Back in 1987, before I’d been to Maxwell’s, before I’d been to Hoboken, there were the Cucumbers. I remember hanging out in my buddy Jeff’s room in central Jersey, listening to their song “My Boyfriend” on the radio. It was on MTV too. Bouncy and catchy and funny. We liked it. Deena Shoskes and Jon Fried of the Cucumbers may not live in Hoboken anymore, but they are in the DNA of the city’s music scene. And they’re not far away so i see them quite a bit—whether playing at a Sandy fundraiser or Pete Seeger tribute—or just showing up in support of another artist, such as young Jack Skuller. They seem like real good people, Deena and Jon, always smiling. And fear not, a solo record doesn’t mean there’s trouble in CucumberLand; Jon appears on 5 of the 12 tracks, providing guitar and backing vocals. But this is definitely Deena’s show, as she follows the advice of opener “My Own Advice” — shaking off malaise and heading out to explore. Like a handful of songs here, there’s a gentle country lilt to this track, but it’s still rooted in pop. Elsewhere there’s Deena’s take on the blues in “All She Wrote,” with background vocals from ‘Jersey Girls’ Rebecca Turner and Elena Skye (of the Demolition String Band). And “My Friend Superman” is jazzy, upbeat pop, pushed along by punchy horns. Hmmm, I may have uncovered the secret identity of Superman, throwing his cape on the floor. Could it be “My Boyfriend” all grown up, the fellow who wouldn’t wash the dishes? Somebody call Perry White! Perhaps my favorite track is the mid-tempo rocker “Mr. Nobody” (more loss! ), complete with chiming guitar and sunny organ fills. Ooh, and an E-Bow! But there are so many good songs, it’s hard to choose. Call me crazy, but in the bright “Bring It All,” I hear a hint of Springsteen’s “Incident on 57th Street.” (Hey, this is New Jersey, after all.) And the lovely country lament “I Will Never Be Your Valentine,” driven by twanging guitar, seems like it could’ve been torn from the Amy Allison songbook. 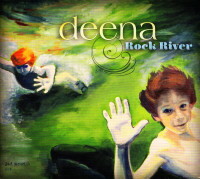 There are co-writes and strong musical support from friends, but in the end this album is 100% Deena, adding a few new tricks to her familiar charm. Smiles all around! I went to Borders more often than B&N. More author readings (Diane Ackerman, William Gibson, Jean Luc Ponty, interesting Mrs Nobodys), and the CD music selection was massive. High prices. I’d go and browse as if it were a museum. I’d appreciate it if you edit my comments, just to erase the entire thing. People may have differing opinions, but I think Censorship is best that way. I had a change of heart lying in bed last night before sleep. Remember how I got sensitive about the “Kurt Cobain, We miss you.” statement? I don’t like to be spoken for? Not only the part you edited had tones of speaking about others in general, I also had an incident at work recently where I got upset during a meeting when someone spoke about the general “us” the general “we.” Double standards in my ethical reactions too. Putting it this way, living with my hypocrisies, I think it would be a hypocrisy to bless myself with copyrighting myself. Since you erased my third comment, the fourth comment doesn’t make the intended sense about “Double Standards.” But I recommend you practice the cut-up and paste technique of Burroughs on your own writing. Polka Radio show on KSPC Clairmont, CA — On Air Now, you listen online. Johnny Cash rendition currently playing. Will check it out, thanks. Unrelated, I recently picked up some old-timey recordings by Polk Miller. I think a variation on wherever Hava Nagila came from is playing now. Or may be Cuban Tango. Have you checked out the Sigmar Polke exhibit at MoMa. Why does a lot of art allowed to be crazy abstract, yet we live mostly in a prissy, logical literay ouvre?